When you passerby the Electric Poles on the road have you ever noticed them?Do you realize the differences of different Electric Poles?Today,let me show you three types of Electric Pole. These are made of seasoned wood and are suitable for lines of moderate X-sectional area and of relatively shorter spans.Such poles are cheap,easily available,provide insulating properties and,therefore,are widely used for distribution purposes in rural areas as an economical proposition. The steel poles are often used as a substitute for wooden poles.They possess greater mechanical strength,longer life and permit longer spans to be used.Such poles are generally used for distribution purposes in the cities.They need to be galvanised or painted in order to prolong its life. The reinforced concrete poles have become very popular as line supports in recent years.They have greater mechanical strength,longer life and permit longer spans than steel poles.Moreover,they give good outlook,require little maintenance and have good insulating properties.But the main difficulty with the use of these poles is the high cost of transport owing to their heavy weight. 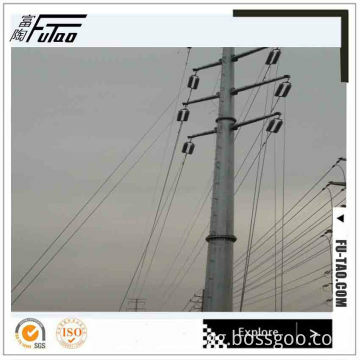 In the above three types of pole,the Steel Pole seems like the best choice,it has longer life when compare to wooden pole,and cheaper than RCC pole.Here comes the question,where can we get the high quality and inexpensive Steel Poles?Please take look at Yixing Futao Metal Structural company,China.We manufacture all kinds of steel poles and steel towers,such like Steel Electric Pole,Steel Light Pole,Electric Transmission Pole and so on.You surely will get what you need at here.